Schindler Lab gave me the welcome opportunity to revisit the Schindler House for a third time and to work again in the very space that marked the beginning of my life in Los Angeles. I arrived here in 1996 on a six-month grant from the Austrian government. The MAK Center’s Artist and Architects-in-Residence Program, the brainchild of former longtime MAK director Peter Noever, had just been put in place, in 1995, to reinvigorate cultural cross-pollination between Vienna and Los Angeles. 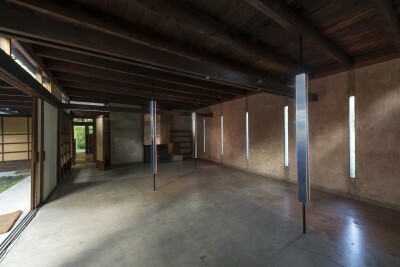 The program was intended to foster a dialogue about art and architecture by reactivating the Schindler House as a place for discourse, very much in alignment with Rudolph and Pauline Schindler’s use of their space. The installation I created as a MAK resident was titled instant days. Inspired by TV dinners that cater to the desire for instant gratification, instant days introduced the notion of the day as a commodity, designed to assist and enrich the consumer’s life. A kinetic aluminum apparatus displayed vacuum-sealed days in an infinite loop, each day’s pouch containing “emotional” nutritional information. The first project in a series examining the value of substance, instant days was a lighthearted comment on a consumer culture in which essence (e.g., ingredients) is irrelevant as long as the expected surface (e.g., look) is delivered. 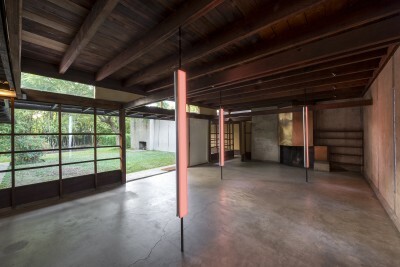 As a location for exhibiting art, the Schindler House can seem adversarial. The house is definitively not a house museum; nothing is “on display.” Completed in 1922, it embodies Schindler’s manifesto for a domestic space: “The modern dwelling will not freeze temporary whims of owner or designer into permanent tiresome features. It will be a quiet, flexible background for a harmonious life” (Manifesto, Vienna: 1912). The floor plan defied contemporary domestic conventions and introduced a live/work environment many decades ahead of its time. But without rooms, windows, trim, or other expected domestic features and decoration, it poses a challenge: the necessity to engage. 3. Embrace and experiment with the existence of contradictions. I proposed an annex connected to the house on a subterranean level via the sunken gardens. The new space would have added 7,000 square feet to the multipurpose cultural complex, allowing an urban park of bamboo gardens and terraced landscape to serve as a portal between the properties. In effect, this would have removed many of the limitations posed by the Schindler House’s intimate scale, while honoring the original architecture and expanding Schindler’s vision of a social and cultural meeting place. Finally, a third engagement with the house: my installation looking west facing east, which I made for Schindler Lab in 2013. Composed of three light pieces, this work was conceived for the original Pauline Schindler studio and revisited the methodology I had established with instant days: remove, refrain, experiment. Working with the same directive that nothing be mounted to the existing structure, the light pieces were suspended by a spring-loaded pole structure and wired discreetly, using the lower beam structure to hide the cables. 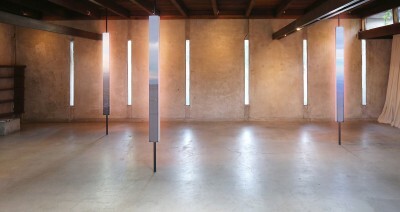 As a result, the installation was materially transient. Playing with the effect of captured light, it created a fissure and projection at once—reflecting on a romanticized past and looking into an unknowable future. In looking west facing east, I wanted to capture a sense of departure with no destination in sight and none desired, a sense of being driven by the ultimate horizon, and a sense of resistance, resilience, and defiance resonant with the Schindler aesthetic—both Rudolph’s and Pauline’s. Andrea Lenardin Madden is a Los Angeles-based architect.